Get acquainted with the stunning sights of Copenhagen on a leisurely 3-hour bike tour of the Danish capital. 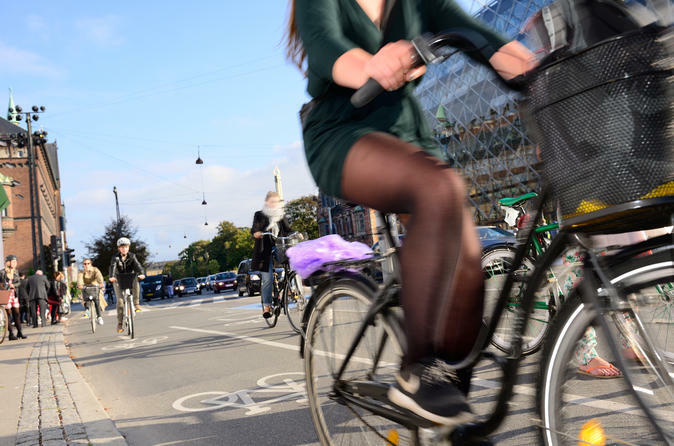 With a knowledgeable guide, ride around the bike-friendly city and see prominent landmarks like Amalienborg Palace and the star-shaped Kastellet Fortress. Stop regularly to capture photographs beside iconic monuments like The Little Mermaid and enrich your knowledge of Denmark’s rich historical heritage with illuminating commentary from your guide. Receive personalized attention from your guide on this small-group tour, limited to only 8 people. Greet your guide at a central Copenhagen location and listen to a short safety briefing before hopping onto your state-of-the-art Bycyklen smart bike. Set off at a leisurely pace and follow your expert guide down winding lanes and atmospheric main boulevards. Cycle parallel to the picturesque quayside to visit the iconic Little Mermaid statue inspired by Hans Christian Andersen’s classic tale. Glide past the brightly colored houses of Nyhavn and gaze at the neoclassical splendor of Amalienborg Palace, the winter residence of the Danish royal family. Explore the botanical beauty of the National Gallery of Denmark’s gardens; pay a visit to the sacred Church of Our Saviour (Vor Frelsers Kirke); and marvel at the stolid Kastellet fortification, a star-shaped fortress with protective ramparts and mossy moats. Breeze along the Strøget, one of Europe’s largest pedestrianized areas, and soak up the convivial atmosphere of King’s New Square. When your tour concludes, return to your original departure point and bid your guide farewell.